Just 6 days and 25 degrees more warmth have elapsed since the last post! This time, the air around Ned Wolf Park is full of sinus clogging particles. They come from both Mother Nature as well as the steady progress of our contractors from Morning Dew Stonework as they continue with our Terrace Wall Project. The cherry trees have burst into bloom as have the Pushkinia bulbs and Euphorbia myrsinites. And as the perennials begin to emerge from their cover of mulch, so too our stone seating wall made of Wissahickon schist has risen around our central terrace. Fran and Brandon have used this windy day to take a break from stacking the stone and starting the messy work of sawing through the reclaimed bluestone that will serve as a seating cap on top of the new walls. They'll be shaping the pieces and getting them ready for the additional laborers that will be needed to hoist those mammoth cap stones into place. Caution tape to safeguard the plants, and string lines to define the finished height of the wall help guide our team to a wall which should serve our community well. And after the steady rains forecast for tomorrow, perhaps we'll see a bit more of that schist sparkling, once all the stone dust has washed away. 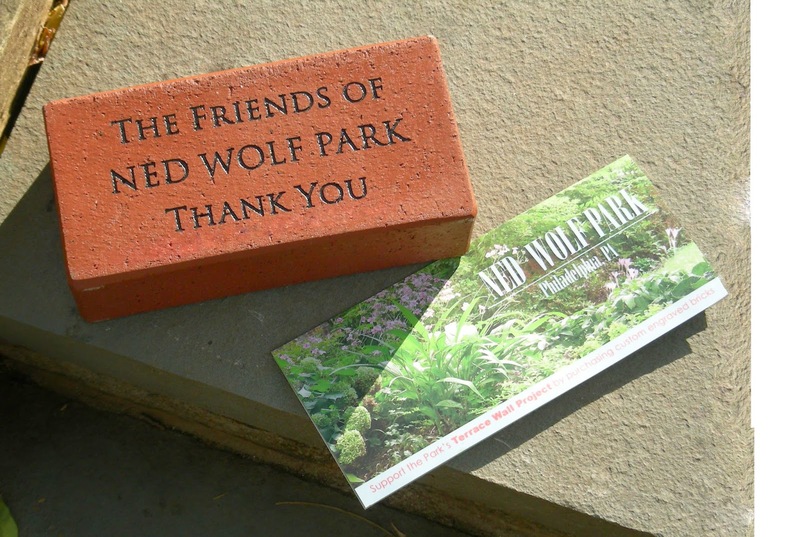 Along the sloping walkway down to McCallum street & wrapping along the sidewalk, the Friends of Ned Wolf Park will be inserting some plants into the wall as it's being constructed. That's the best way to ensure that the roots will have a pathway into the soil behind the wall. The bluestone cap stones, perhaps originally quarried in the 19th C., are being trimmed with a carbide blade circular saw, kicking up quite a dust storm. Sorry to those neighbors who are listening to that noise, but I'm sure it will all be worth it. These cap stones will surround the central terrace and create a new seating area. 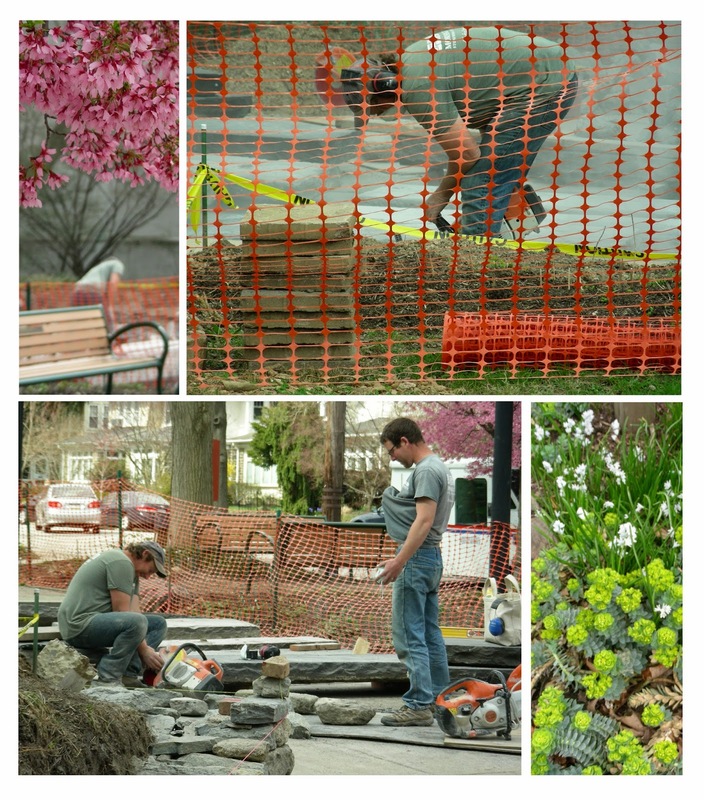 And the trimmings will be incorporated into the brick design that includes our generous donors' engraved bricks. Despite the progress of our contractors, we still need some help to fund this Terrrace Wall Project. You can help with your donation of $100. or more. There are brochures that include an order form located in the info boxes in the park. Or you can pay via PayPal directly on this website. See the Donate button in the righthand column!